By Tim Royner: Chris Eubank Jr. (27-2, 21 KOs) believes his career is going to be turned around completely by beating former super middleweight champion James DeGale (25-2-1, 15 KOs) this month on February 23 in their high profile fight on ITV Box Office and SHOWTIME Boxing at the O2 Arena in London, England. Eubank Jr. has seen his career take a big hit from his loss to George Groves last year. Eubank Jr. came into that fight with a lot of boxing fans thinking he was going to win, but everything went to pieces almost immediately when it was clear that Groves had too much skill for him in defeating him by a one-sided 12 round decision. Eubank Jr. has trained hard ever since then with a new trainer, and he believes he’s improved enough to contend for the titles at 160 and 168. But before Eubank Jr. can do that, he needs to beat DeGale, 33, and send him into retirement. DeGale sees this as a fight that could mark the end of his career if he loses, which many people believe will be the case. “He needs to be taught a lesson. He needs to be taken down a peg or two,” Eubank Jr. said to IFL TV about James DeGale. “I still want to fight. I still want a rematch [with Billy Joe Saunders]. I can’t say whether it’ll happen. If he wins his fight and wins his title back, of course, that’s a fight that I would be more than willing to entertain after I beat DeGale,” Eubank Jr. said. Eubank Jr. is still smarting over his 12 round split decision loss to Billy Joe Saunders from November 2014. Eubank Jr. wants to avenge that defeat. But for him to do that, Saunders will need to beat WBO middleweight champion Demetrius Andrade to recapture his title that he vacated recently after testing positive for a banned substance. There are other fights out there for Eubank Jr., both at middleweight and super middleweight. Saunders would be a good match-up for the domestic audience, but not for the rest of the world. If Eubank Jr. wants to impress boxing fans worldwide, he’ll forget about Saunders and focus on going after Saul Canelo Alvarez or Gennady Golovkin. Those guys will give Eubank Jr. the most amount of attention. 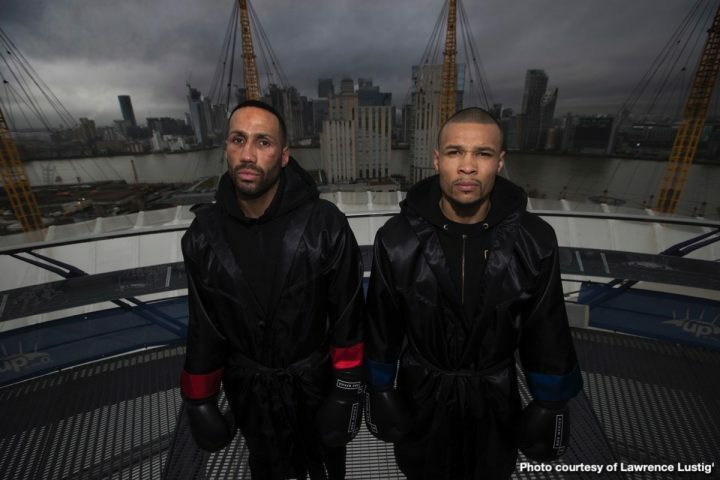 Beating DeGale and Saunders will impress British boxing fans, but it won’t create interest from fans outside of the UK, as they don’t rate either of those guys. Saunders is seen by a lot of non-British fans as timid champion, who failed to make fights against GGG and Canelo, and milked his WBO title for three years fighting weak opposition before testing positive for a banned substance and then vacating his belt. Eubank Jr. can do a lot better than that by aiming high by going after Callum Smith, Canelo or GGG. “It’s not going 12 rounds. I don’t think he’s going to be able to stay with my type of velocity, and the fierceness I’m going to bring into the ring,” Eubank Jr. said about DeGale. “The tactics, the smarts. I think everything is going to be too much for him. He’s going to be up for it, but he’s going to fall short. But I do believe it’s going to be a very, very entertaining fight. The styles that we have are going to mix very well. He’s a proven fighter, so you can’t underestimate a man like that. He rises to the occasion when he has a live wire in front of him. He prepares accordingly, and he’s always going to be a danger, but I’m a man on a mission. It’s do or die for me, sink or swim, so I’m going out there and I’m going to stop him,” Eubank Jr. said. Eubank Jr. has made a lot of boasts in the past that he was unable to fulfill, but in this case, he’s got a very good chance of doing exactly what he says he’s going to do against what’s left of Chunky. DeGale has looked utterly faded since his 12 round draw against Badou Jack two years ago in January 2017. DeGale had shoulder surgery, which is said to have impacted his performance against fringe contender Caleb Truax in December 2017. DeGale lost that fight. However, DeGale fought just as poorly in his rematch with Truax last April in beating him by a controversial decision. DeGale got the nod, but it was a very dubious decision with a lot of boxing fans believing it was a gift by the judges. About the only thing DeGale looked good at in that fight was holding. He did a bang up job of holding Truax all night to prevent him from throwing punches. DeGale looked like another person inside the ring. It wasn’t the DeGale that boxing fans had known his entire career. It was an old and feeble impostor, who couldn’t throw punches, and was just looking to stall out every round in order to get to the end of the fight. The decision was an awful one. In giving DeGale the victory, the judges only bought him a little time, because he’s going to need to be able to fight at a high level against Eubank Jr. if he wants to keep from getting knocked out by him. This is a fight where the judges aren’t going to be able to save DeGale. If all he can do is hold and run all night long, he’s going to lose to Eubank Jr. by knockout. The judges won’t be able to save DeGale this time. This will be Eubank Jr’s second fight since his loss to Groves in the World Boxing Super Series final last year in February. Eubank Jr. looked good in coming back from that loss in defeating JJ McDonagh by a third round knockout last September, but that wasn’t a world class fighter or even close to being one. DeGale is a much better talent than McDonagh, even though he appears to be shot at this point. “I think the haters, the non believers, the people that haven’t liked me my entire career, but the majority of people know I’m the real deal,” Eubank Jr. said. “They see what I’ve done in my career. They see how I fight, and they know this is real. This isn’t a gimmick. As James DeGale says, ‘This is not a disillusion.’ I’m not a fake. I live the life. You cant’t have the kind of success that I’ve had in the sport without being the real deal,” Eubank Jr. said. Eubank Jr. is missing the point for why the boxing fans dislike him. They see a guy that had a chance to fight Gennady Golovkin in 2016, but he wasted the opportunity by negotiating too long. They see a guy that should have been fighting world class opposition in 2016, and had a chance to challenge for a world title against WBA middleweight champion Danny Jacobs, but instead passed it up in order to fight the likes of Nick Blackwell, Tom Doran, and Renold Quinlan. Eubank Jr. has been an underachiever. He’s a textbook definition of that. Instead of going after the best, Eubank Jr. took the easy path, fighting Blackwell, Doran, Quinlan and Avni Yildirim before finally stepping it up in his seventh years as a pro to face George Groves in the World Boxing Super Series tournament in 2018 and winding up getting embarrassed by him and exposed. “Now it’s about me going out there and beating him so I can put myself in position where I can challenge for these belts, which is what I want,” Eubank Jr. said. “That’s the real goal. He’s a stepping stone. He’s my ticket to be able to challenge these top fighters in the middleweight and super middleweight division. Beating him puts my name right back up there. That’s my goal. It’s a big fight. It’s a big step up. I have to win. I have to perform. If I don’t perform everyone has the right to say I’m delusional. I’m not the fighter I say I am. They have the right to say that if I don’t come out on top against James DeGale,” Eubank Jr. said.